Preheat the oven to 425°F. Line a cookie tray with parchment paper. Use a small bowl to mix the crushed garlic and olive oil. Set aside. Use a kitchen brush to paint the pita with the olive and garlic mixture (set the leftover oil aside). Place strips of onions on the pita and then a layer of shredded cheese. Mix the Brussels sprouts with the rest of the oil and garlic in a medium bowl. Stir until well combined. 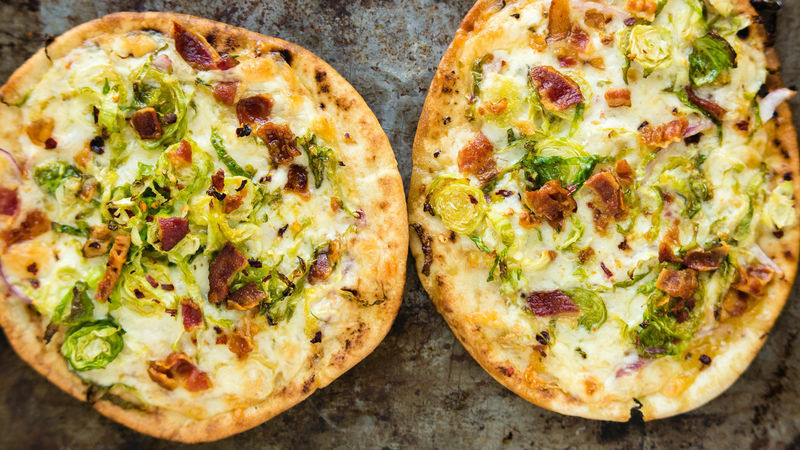 Add a layer of Brussels sprouts over the cheese followed by a layer of bacon. Season with salt and red pepper flakes to taste. Bake for 10-12 minutes or until the bread is crunchy and cheese has melted. To cook the bacon just place them in a pan over medium heat and cook until crunchy. I've been preparing pizza with pita bread for a long time because it's so easy, we always have it hand and the texture is crunchy and irresistible. This time I prepared them with Brussels sprouts and bacon… delicious! This pizza is a little spicy due to the pepper Jack cheese, the garlic and red pepper flakes. If you're making this pizza for kids, I recommend using mozzarella cheese and less garlic. Enjoy!